Patterson Real Estate Advisory Group assisted The Flournoy Companies on the recent refinancing of 35 Folly, a 301-unit, class A multifamily project located in the West Ashley submarket of Charleston, South Carolina. Financing was through Metlife Investment Management. Patterson Real Estate Advisory Group assisted Angelo Gordon in closing acquisition financing with SunTrust Bank for the purchase of Serta Simmons Bedding, LLC’s new 210,000 square foot headquarters building in the Assembly development in Doraville, Georgia. Lance Patterson and other local real estate experts participated in a recent panel discussion for Biznow with comments on factors that might contribute to the next recession. Patterson Real Estate Advisory Group assisted Pope & Land with the recent closing of a construction loan through Cadence Bank for the development of the first phase of a 24-acre, mixed-use development known as Northwinds Summit in Atlanta. 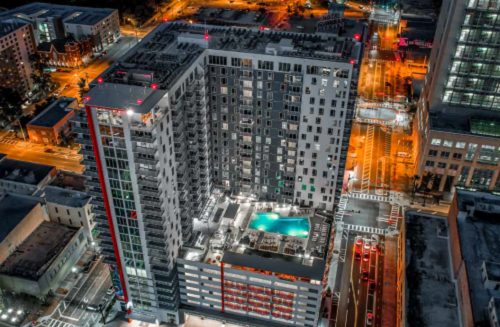 Patterson Real Estate Advisory Group arranged a bridge loan for Nine15, a 362-unit, 23-story high-rise, multifamily property located in downtown Tampa, Florida. Carter is the owner and developer of the Project that delivered in 2017. Patterson arranged financing with LoanCore Capital. Patterson Real Estate Advisory Group arranged construction financing for “The Brunswick,” a 193-unit multifamily project in Historic Downtown Norcross, Georgia under development by Gateway Ventures and Centro Development. Patterson arranged construction financing with Synovus Bank. Patterson Real Estate Advisory Group served as capital advisor to Shelton McNally Real Estate Partners on a 199-unit multifamily community seven miles east of downtown Nashville in the growing Donelson submarket. Patterson arranged the construction financing which included a joint venture equity partnership with Lubert-Adler Real Estate Funds and a construction loan with Cadence Bank. Patterson Real Estate Advisory Group served as capital advisor to The Loudermilk Companies in the recent closing of a refinancing for 309 East Paces, a restored. twelve-story office building in the heart of Buckhead Village. The building previously served as headquarters for Aaron’s. Permanent financing was provided by Aegon USA Realty Advisors. Patterson served as capital advisor to Carter on the recent closing of construction debt financing with First Citizens Bank for the development of a 7.2-acre student-housing and commercial mixed-use development for the Morehouse School of Medicine in Atlanta, Georgia.